$1 Dollar Bill – George Washington – Elected first President of the United States February 4, 1789 – Founding Father, George Washington was first put on the dollar bill in 1869 – Seven years after the bill was put into print. The average dollar bill’s lifespan is just 18 months due to heavy wear and tear. $2 Dollar Bill – Thomas Jefferson – One of the Declaration of independence authors, Jefferson has been on this bill since 1869. The U.S. government has launched several failed campaigns to increase its popularity since the early 1900s. $5 Dollar Bill – Abraham Lincoln – The 16th U.S. President, Lincoln is widely credited with ending slavery and saving the Union and has appeared on this bill since 1914. In 1964 the phrase “In God We Trust” was added to the bill. $10 Dollar Bill – Alexander Hamilton – The first U.S. Secretary of the Treasury, he is one of just two non-presidents on currently circulating U.S. Bills. The first $10 bill in 1861, however, featured a portrait of Lincoln. $20 Dollar Bill – Andrew Jackson – The 7th U.S. president and a highly polarizing political figure, Jackson’s face replaced Cleveland’s on this bill in 1928. Since, several petitions have circulated to remove him but have not succeeded. $50 Dollar Bill – Ulysses S. Grant – The 18th U.S. President and famous Civil War general, Grant first appeared on the bill in 1913. In both 2005 and 2010 legislation to put Ronald Reagan on the bill instead was introduced in Congress, but voted down. Rare Bills – Have you seen me? $500 Dollar Bill – William McKinley – The 25th U.S. President, McKinley was assassinated while serving in 1901 and has been featured on this bill since 1928. $1,000 Dollar Bill – Grover s. Cleveland – This bill featured the 22nd and 24th U.S. President. Though currently discontinued, this was the most expensive paper money ever auctioned off; a “Grand Watermelon” $1,000 bill from 1890 sold in 2006 for $2.3 Million to an art collector. $10,000 Dollar Bill – Salmon P. Chase – The largest denomination of U.S. currency to ever publicly circulate, this bill featured Salmon P. Chase, Lincoln’s Treasury Secretary. As of today there are 336 bills still known to exist. $5000 Dollar Bill – James Madison – Issued until 1969, this bill featured Madison, known as the Father of the U.S. Constitution. This denomination was discontinued due to lack of use along wih the $1,000 and $10,000 bills – as of today there are 342 still known to exist. $100,000 Dollar Bill – Woodrow Wilson – The largest note ever printed, it featured Woodrow Wilson, the 28th US. President. However, it was never publicly circulated and was only used by the Fed to Transfer money during the Great Depression. Penny – Abraham Lincoln – In 1909, Teddy Roosevelt commissioned the coin to celebrate the 100th birthday of Abraham Lincoln. Nickel – Thomas Jefferson – In 1938, a competition for a drawing of Jefferson to be put on the nickel in 1943 the 100th birthday of Jefferson. The winner was awarded $1,000. Dime – Franklin D. Roosevelt – Soon after the death of Roosevelt in 1945, a congressman from Virginia called to put Roosevelt on the dime in honor of his work for founding the March of Dimes Foundation to combat polio. Quarter – George Washington – In 1924 Congress created the U.S. George Washington Bicentennial Commission and voted to mint a Washington Quarter to celebrate the 200th anniversary of his birth. Sacagawea Golden Dollar – The coin features Sacagawea, the Shoshone guide who aided the explorers of the transcontinental Lewis & Clark Expedition. 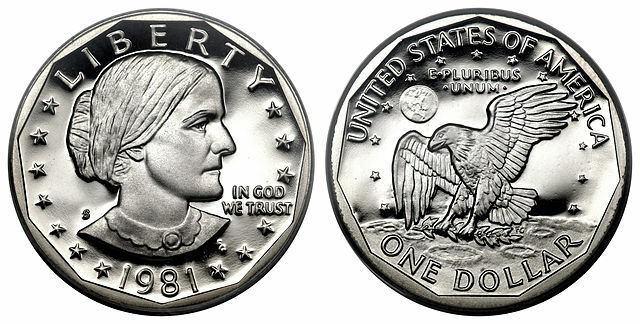 Susan B. Anthony Dollar – The coin features the famous women’s suffrage leader who helped women gain the right to vote. Changes are coming: The U.S. Treasury announced on April 20, 2016 that the front of the $20 bill will feature Harriet Tubman on the front, with Andrew Jackson and an image of the White House on the back. The new $5 and $10 bills will feature women and civil rights leaders on the back. The designs will be unveiled in 2020, but the circulation date has yet to be released.